NAPLES, Idaho--(BUSINESS WIRE)--In an area recognized as one of the region’s most important wildlife linkage zones and one of Idaho’s highest priority areas for benefiting forest-based markets, approximately 5,568 acres of forestland has been permanently conserved to benefit wildlife, local economies, clean water and recreation. These forests, located east of McArthur Lake between Sandpoint and Bonners Ferry, were placed under conservation easements in September. 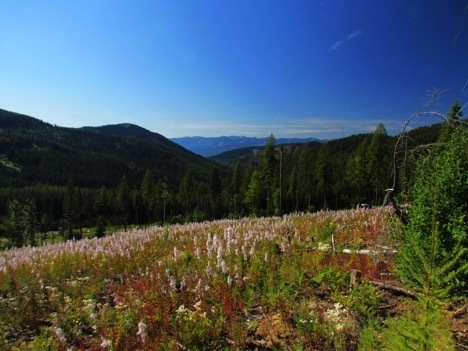 The conservation easements were conveyed to the Idaho Department of Lands (IDL) through a partnership between The Molpus Woodlands Group, LLC, on behalf of clients, the Idaho Department of Fish and Game, The Nature Conservancy and the U.S. Forest Service. Conservation easements are voluntary and legally binding agreements that compensate landowners for limiting certain uses, such as development and subdivision, while still retaining private ownership. Molpus believes that private working forests provide environmental, economic and social benefits to meet the needs of present and future generations. Molpus, committed to sustainable forestry and sound stewardship practices, manages these forestlands to adhere to Sustainable Forestry Initiative® standards. This initiative is based on principles that promote sustainable forest management, including measures to protect water quality, biodiversity, wildlife habitat, species at risk, and forests with exceptional conservation value. “We are proud to work with The Nature Conservancy and the public agency partners to dedicate these properties as working forests into perpetuity. Our commitment to manage these properties on a sustainable basis benefits long-term timber production, wildlife, and recreation,” said Ken Sewell, Chief Operating Officer of Molpus. The conserved lands are located within the McArthur Lake Wildlife Corridor, an area of Idaho nationally recognized for its scenic beauty, outdoor recreation and wildlife. By protecting this area from development, the project allows for permanent public access for activities such as hiking, hunting and berry picking. Funding for the project came through the U.S. Forest Service Forest Legacy Program, and from Idaho Department of Fish and Game and the Conservancy. The program seeks to protect “working forests” – those that support the natural resources economy while protecting water quality, providing habitat, opportunities for recreation and other public benefits. Forest Legacy funds originate from the Land and Water Conservation Fund, royalties paid by energy companies drilling for oil and gas on the Outer Continental Shelf. The revenues from the depletion of one natural resource support the conservation of another precious resource – our land and water. Legacy funds are used for forest conservation throughout the United States and Idaho receives project grants through a nationally competitive process. IDL is working with other landowners in the McArthur Lake and Hall Mountain areas of Boundary County and at Clagstone Meadows in Bonner County. The Idaho Department of Lands administers Idaho’s Forest Legacy Program through the Forestry Assistance Bureau. To date, this program has successfully conserved nearly 73,000 acres of privately owned working forestland. In addition, IDL manages more than 2.4 million acres of Idaho endowment lands, for the benefit of endowments, primarily public schools. For more information regarding Forest Legacy, visit: www.idl.idaho.gov/forestry/forest-legacy. The mission of The Nature Conservancy is to conserve the lands and waters on which all life depends. In Idaho the Conservancy has conserved and protected nearly 400,000 acres. To learn more: www.nature.org/Idaho. The Molpus Woodlands Group, LLC, a Registered Investment Advisor, was founded in 1996 as a Timber Investment Management Organization (TIMO) and has a company legacy dating to 1905. Molpus is one of the oldest timber-related companies in the nation, with experience in all facets of timber management, manufacturing, and marketing. Molpus is one of the few TIMOs that has all of its core businesses and forestry functions handled or supervised by in-house experts. Molpus acquires, manages, and sells timberland as an investment vehicle for pension funds, college endowments, foundations, insurance companies, and high-net-worth individual investors. The company focuses on ensuring long-term optimal cash returns on investments while practicing responsible forest stewardship. Molpus currently manages approximately 2 million acres of timberland investments located in eighteen states. Nothing herein constitutes an offer to sell or a solicitation of an offer to subscribe for or buy any security with respect to any fund. For more information, visit http://www.molpus.com/. The U.S. Department of Agriculture is an equal opportunity provider and employer. For more information, visit: www.fs.fed.us/spf/coop/programs. All wildlife, including all wild animals, wild birds, and fish, within the state of Idaho, is hereby declared to be the property of the state of Idaho. It shall be preserved, protected, perpetuated, and managed. It shall be only captured or taken at such times or places, under such conditions, or by such means, or in such manner, as will preserve, protect, and perpetuate such wildlife, and provide for the citizens of this state and, as by law permitted to others, continued supplies of such wildlife for hunting, fishing and trapping (Idaho Code 36-103a). For more information, visit https://idfg.idaho.gov/. Approximately 5,568 acres of Idaho forestland has been permanently conserved to benefit wildlife, local economies, clean water and recreation.